Although Wendy’s will always be the Pablo Picasso of brand pettiness, plenty of other companies are mastering the fine art of ruthless bullying via emoji and hashtag. 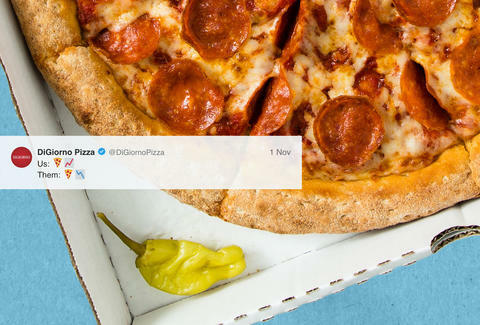 Even DiGiorno, the purveyor of frozen pizza, has emerged as a rising star of social media smack talk in recent months, and its latest target is Papa John’s. It all started when Papa John's blamed a dip in sales on the NFL. DiGiorno had its own interpretation of the numbers. To make the subtweet a little less subtle, DiGiorno took on Papa John's famous tagline, "Better ingredients. Better Pizza." 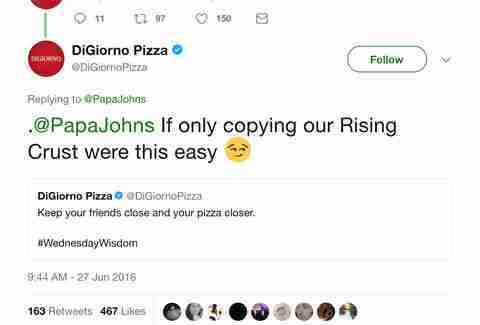 Then the frozen pizza brand brought up a time when it publicly called out Papa John's for stealing a tweet. Then DiGiorno returned to emoji shaming like a seasoned boxer returning to the jab -- and also because this is 2017 and emojis are how conflicts are started and settled. DiGiorno really went all in when it changed the bio of its Twitter account. Papa John finally retaliated with a new Twitter bio of its own, but that tweet has since been deleted, and the bio is back to normal. Actually the only evidence that remains of Papa John's attempt to fight back is DiGiorno's reply, which is probably not the result Papa John's was after. There's little doubt that DiGiorno won this week's petty award. James Chrisman is a News Writer at Thrillist who tries not to roast people because it's not very nice. Send news tips to news@thrillist.com and follow him on Twitter @james_chrisman2.